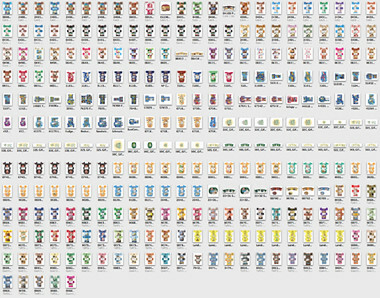 These microscopic elements are the 400 ice cream cartons I've worked on in the last two years. I've been designing/laying out ice cream cartons for nearly 9 years. Lately I've been curious about how many I may have worked on over the years. Rough estimates put the number easily over 1000 possibly closer to 2000. Surprisingly, I've never gotten bored working on them. These are cool...need a microscope! Tried to get a closer look on flickr, but no dice. Dang! Hey, will be in touch about the channel thing here in a bit...working on aggregating etsy, cafepress, etc. Ben Carter is THE MAN!! !